On occasion, we will post a full Masters Academy video lesson to our Facebook page for a 24 hour period. We’ll also post short snippets as well. If you want to know when these videos become available, then you should be sure to like my Facebook page and make sure your notifications settings are configured so that Facebook will notify you when a video has been posted. First of all, you’ll have to “like” the Ben Willmore Facebook fan page. I have two Facebook pages, so be sure to click HERE and click the LIKE button that’s found near the top of the page to make sure you’ve got the correct page. Just because you’ve “liked” my Facebook page doesn’t mean that Facebook will do anything special to let you know that I’ve posted a video. Facebook limits which posts you see and you could easily miss an important post if you don’t change a few additional settings. After liking my Facebook page, you’ll find that the “Like” button will change into a “Liked” button to indicate that you’ve already liked my page. If you click that button a second time, you should be presented with a special menu. 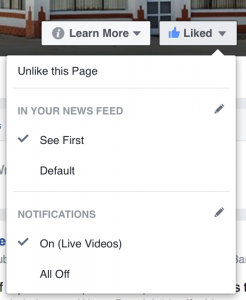 I suggest that you choose the See First option near the top of the menu to make sure any posts I create will show up at the top of your Facebook feed and then choose the “On (Live Videos)” choice from the same menu to make sure you’re notified if I ever start streaming a live video. With the above settings, you should be aware when we post a free-to-watch video because they will appear at the top of your Facebook news feed. Enjoy!